The Miami Trace 400 relay team of (l-r); Lauren Truex, Addy Braden, Clare Sollars and Kaitlyn Taylor, placed second with a season-best time of 4:32.59. Miami Trace’s Destiny Shook swimming the butterfly as Clare Sollars prepares to dive in for the freestyle in the 200 Medley Relay at the 2017 SCOL swim meet at McClain High School in Greenfield. Miami Trace’s Gretchen Rife swimming the butterfly at the 2017 SCOL meet at McClain High School in Greenfield. GREENFIELD — The South Central Ohio League girls swim meet was held Tuesday, Jan. 31, 2017 at McClain High School with seven schools competing. The pool was packed with spectators and the McClain hosts set up a closed circuit big screen viewing of the pool for the team camps in the cafeteria. The schools were able to submit three swimmers in individual events and two teams for each relay. The swimmers can compete in two individual events and two relays. The top 12 finishers in each event earned team points, with relay events scoring double. Wilmington won the meet with a team score of 311, followed closely by the Miami Trace girls with a score of 262. Chillicothe placed third with 256 points, McClain placed fourth with 194 points, and Clinton-Massie, fifth with a team score of 139. The Washington girls team came in sixth with 81 points, followed by Hillsboro with 59 points. The evening kicked off with the 200 Medley Relay, which includes 50 yards of each stroke. The Miami Trace team of Tori Morrison, Taylor Barrett, Destiny Schook, and Clare Sollars placed 6th with a time of 2:27.40, followed closely by the second Miami Trace team, Kylie Pettit, Addie Braden, Morgan Leasure and Kaitlyn Taylor placing 7th with a time of 2:31.98. The Washington team of Andrea Fitzpatrick, Casey Ramirez, Mackenzie Truex and Camryn Waldrop placed 12th with a time of 2:47.24. The first individual event was the 200 yard freestyle. Miami Trace finished strong with Addie Braden placing third with a time of 2:28.55, Lauren Truex fourth at 2:37.09 and Kylie Pettit 10th with a time of 2:53.95. Washington’s competitors were Camryn Waldrop, 3:24.28 and Sierra Peters, 3:43.35. Lady Lions’ swimmer Megan Rohrer placed fourth in the 200 individual medley with a time of 2:58.15, and teammate Mackenzie Truex finished with a time of 3:19.81. Lady Panther swimmers Taylor Barrett placed 9th at 3:12.45 followed closely by 10th place finisher Morgan Leasure at 3:12.63. Kiersten Odierno also competed for Miami Trace. Miami Trace swimmers Kaitlyn Taylor placed 4th in the 50 yard freestyle with a time of 30.19, Lilly Litteral placed seventh at 31.56 and also finishing with points scored was Carissa Hostetler at 12th with a time of 33.70. Washington’s Andrea Fitzpatrick placed 11th at 33.68. Also competing for Washington were Alexandria Cartwright, 38.26, and Casey Ramirez, 41.23. The Panthers’ Destiny Schook placed 6th in the challenging 100 yard butterfly with a time of 1:33.06. Morgan Leasure placed 12th in 1:50.51, followed by Gretchen Rife, 1:58.81. Washington had three swimmers place in the point range; MacKenzie Truex, 8th, 1:36.01, followed by Aria Marting, 9th, 1:43.22 and Grace Gerber, 10th, 1:43.45. With three swimmers finishing strong, Miami Trace scored the most team points for individuals in Event 6, the 100 yard freestyle. Clare Sollars placed second with a time of 1:05.72. Kaitlyn Taylor placed fifth at 1:07.26 and Tori Morrison placed seventh at 1:09.26. Competing for Washington were: Faith Kobel, 1:23.17, Christina Luebbe, 1:33.22, and Sierra Peters, 1:35.39. The next event was the lengthy 500-yard freestyle. Miami Trace had another strong showing with Clare Sollars placing third with a time of 6:31.75, followed by Addie Braden in fourth with a time of 6:46.44 , and Lauren Truex in 8th at 7:24.97. Placing for Washington were Grace Gerber, 6th, with a time of 7:12.91, and Camryn Waldrop, with a time of 9:12.18. The fas- paced 200 yard freestyle relay had the Miami Trace team of Lily Litteral, Carissa Hostetler, Keely Smith and Destiny Schook placing fourth with a time of 2:12.18, with split times of 32.14, 33.53, 33.02, and 33.49 respectively. They were followed closely by the second Miami Trace team, Marissa Sheets, Ally Streitenberger, Olivia Flerchinger, and Gretchen Rife, (split times of 34.84, 33.96, 32.60, and 34.26, respectively), team placing sixth with a time of 2:15.66. Washington’s team of Faith Kobel, Megan Rohrer, Camryn Waldrop and Grace Gerber placed seventh with a time of 2:20.19. Also competing for Washington, Sierra Peters, Mackenzie Truex, Alexandria Cartwright and Kara Vohra finished with a time of 2:38.21. Miami Trace swimmer Tori Morrison placed fourth in the 100 backstroke with a time of 1:20.25 and Kylie Pettit place 8th at 1:28.99. Also competing for Miami Trace was Kiersten Odierno with a time of 1:44.09. 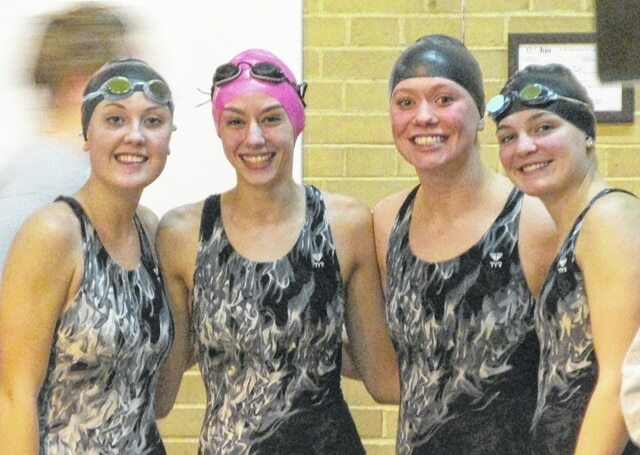 Swimming for Washington were: Christina Luebbe, 1:36.69, Andrea Fitzpatrick, 1:48.17, and Faith Kobel, 1:57.85. Event 10, the 100 yard breaststroke, was Washington’s best showing for individual team points with swimmers Megan Rohrer finishing fourth at 1:25.71 Casey Ramirez, ninth, 1:34.32, and Alexandria Cartwright, 1:45.35. For Miami Trace, Destiny Schook placed seventh at 1:34.01, Taylor Barrett 10th, 1:36.34 and Kate Leach, 12th, 1:38:78. The evening culminated with an exciting 400 yard freestyle relay competition in which the participants swim 100 yards each. Leading off for Miami Trace was Lauren Truex, (split time 1:10.61), followed by Addie Braden, 1:09.07, Kaitlyn Taylor, 1:07.68 and anchor Clare Sollars, 1:05.03. The team finished in second with their best time this season, 4:32.59. Also placing for Miami Trace with a sixth place finish, Morgan Leasure, 1:10.95, Ally Streitenberger, 1:15.78, Kylie Pettit, 1:14.49 and Tori Morrison, 1:11.77, team time of 4:52.99. Both Washington teams finished in the point tally with Faith Kobel, Aria Marting, Christina Luebbe and Alexandria Cartwright placing 10th with a time of 5:51.31, followed by Andrea Fitzpatrick, Kara Vohra, Sierra Peters and Casey Ramirez in 11th place with a time of 6:27.68. The teams are now preparing for the Sectional meet on Saturday, Feb. 11 at the Ohio University in Athens. https://www.recordherald.com/wp-content/uploads/sites/27/2017/02/web1_4-MT-girls-swimmers-from-SCOL-meet-2017.jpgThe Miami Trace 400 relay team of (l-r); Lauren Truex, Addy Braden, Clare Sollars and Kaitlyn Taylor, placed second with a season-best time of 4:32.59.
https://www.recordherald.com/wp-content/uploads/sites/27/2017/02/web1_clare-medley.jpgMiami Trace’s Destiny Shook swimming the butterfly as Clare Sollars prepares to dive in for the freestyle in the 200 Medley Relay at the 2017 SCOL swim meet at McClain High School in Greenfield. 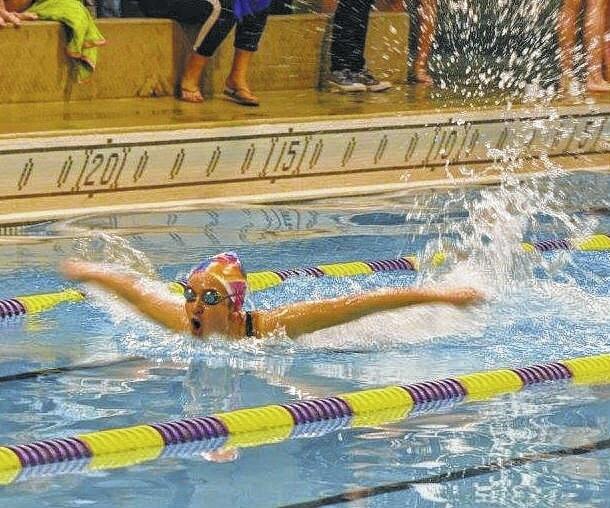 https://www.recordherald.com/wp-content/uploads/sites/27/2017/02/web1_Gretchen-Rife-2-.jpgMiami Trace’s Gretchen Rife swimming the butterfly at the 2017 SCOL meet at McClain High School in Greenfield.